Android and iOS Smartphones will now be able to view webcam and manual video webcasts. Since phones show video in full-screen mode, we have added a button to toggle between full-screen video mode, and audio mode with access to widgets, polls, etc. When a webcast attendee wants to view a video event, they click the button below. If they want to exit the video (to view slides or ask a question), they click the “done” button (iOS) or the “back” button (Android) which will exit the video and allow the webcast attendee to access other content. 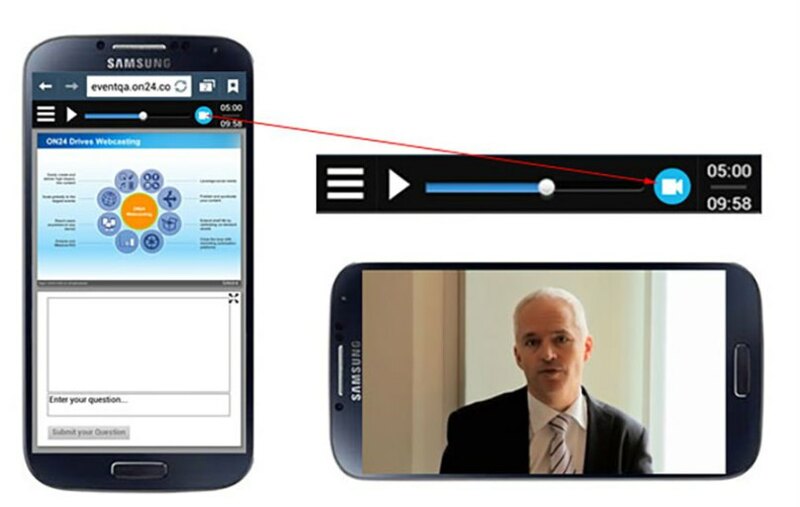 If you have an audio event, you can share a video on mobile devices using video clips. When a clip is pushed, a play button will appear in the slide area. When that play button is pushed, the video clip will either play in the slide area or play full screen (depending on the device).